Did you know that In the U.S. there is one suicide every 13 minutes & suicide is the 10th leading cause of death in the U.S?! These are sobering statistics...not just a statistics but representative of people who have come to an extreme place of hopelessness and despair and ended their lives. This is heart wrenching! I've been in that place and it's not a place I want to ever go back to nor do I want anyone to go to that place. There are a lot of influences that send people that direction but not all of the influences are for clinical reasons but for spiritual and emotional reasons too. No matter what, we as a society need to pay closer attention to mental health as much as we do other issues and put resources toward helping reach people before they get to that point....so they don't get to that point. 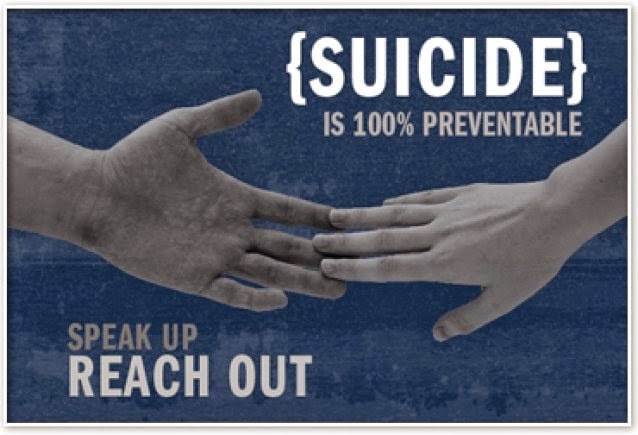 I share the linked report, not because everything they say is the full picture of suicide, because it's not, but to #1 Beg you, if you are in that place now or heading that way...please reach out for help...simply start by sharing with someone that you're struggling! and #2 For awareness! It may be difficult to know sometimes (In my situation, most people had no idea I was depressed and suicidal), but you and I don't realize that there very well maybe people in our lives that are heading that direction and we need to do our best to reach out to those who (may not be suicidal yet) are down, going through a hard time, are in a predicament because of their actions and a bunch of different reasons and we need to stand in the gap and come along side them somehow...be the ones who show that they are highly valued, they are loved, that they matter! You and I can be that person to them! To help give them and build hope into them! If you've read this far, thank you...Let's pray and be a part of the solution. Let's pray that the tide it turned in regard to suicide. Take a look at this report when you have a few moments.